Big, impressive, reliable, and fast. my Creator's have feet of clay. has neither power nor grace. (but The Company® calls it Iron®). Fortunately as part owner of said Harley-Davidson Sportster, I know all of that and so do not let it interfere with enjoying it as a ride. If considered a vintage bike (like circa 1960) rather than its proper age (1990) and ridden accordingly the Sportster is an enjoyable bike to ride. One cannot hurry. It is too heavy, too slow, and too unforgiving in corners. I have a similar vintage custom built 500 cc single cylinder motorcycle in the garage that, while facing an almost 40% gap in displacement (and a cylinder), will out run, out stop, and out handle the Sportster. Nevertheless, there is a time and place for the Sporty. It reminds one to slow down, to take roads with names that do not start with an "I", or "US", or even "State" Highway. No, stick with County highways, or even those roads named after the farmer who owns all the land in the area, and all will be well. Those roads that go through towns you never see on a map because they are too small, unincorporated. Wave to the septuagenarians on their porches. Observe the tractor tilling the land. Note how high the creeks and rivers are. 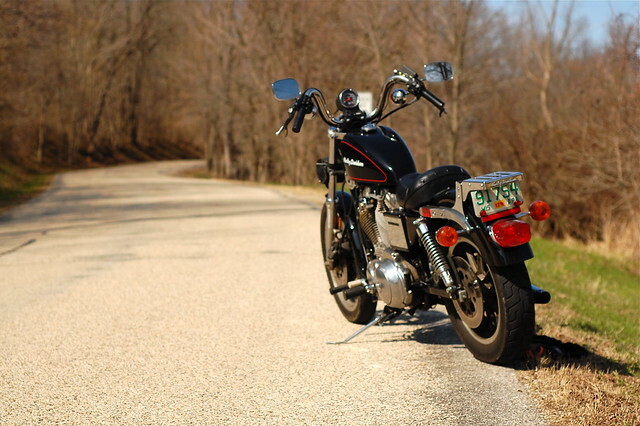 When ridden thus, there is no Sportster's Lament. Book of Nataraj, Chapter II, Verse 19. Sometimes I wonder where Harley Davidson hides the extra hundred pounds on a Sportster. Are the fenders lead? Is the swingarm made from I-beams? Was the major design work done by Caterpillar?